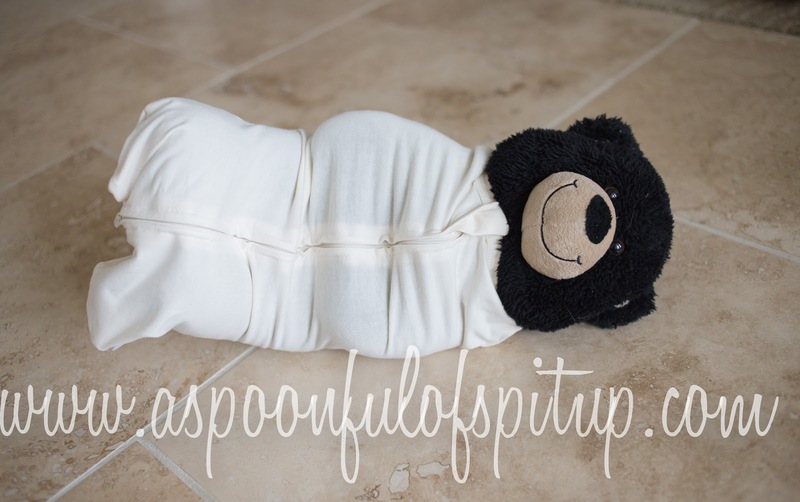 A Spoonful of Spit Up: Summer Infant Swaddle Giveaway! So. Gibson has decided that 5:30 is his wake-up time for the last week. I'm the sleepiest lady in the land. For real. Coffee is my favorite of God's creations this week. In any case, I'm excited to get out of molar land and have a normal baby who eats and sleeps again (is there such a thing?). It turns out that getting babies to sleep is one of the hardest (and most important) parts of parenthood. If they don't sleep, they scream. And then they continue to not sleep. And scream some more. And then they scream again. For us, swaddling and white noise were the two most valuable tools in the battle that was sleep. When we had to stop swaddling I cried. It always calmed Gibson down so well...being snuggled up is reminiscent of being in the warm, watery womb! Or so I'm told. This might be a good time for me to confess that my friend Matt swaddled me once when I was pregnant. He was showing Danny how. It was WONDERFUL and I loved it. I felt like a snuggly little caterpillar! Since I'm obviously a huge fan of swaddling, I'm super excited to tell you about Summer Infant's swaddles! 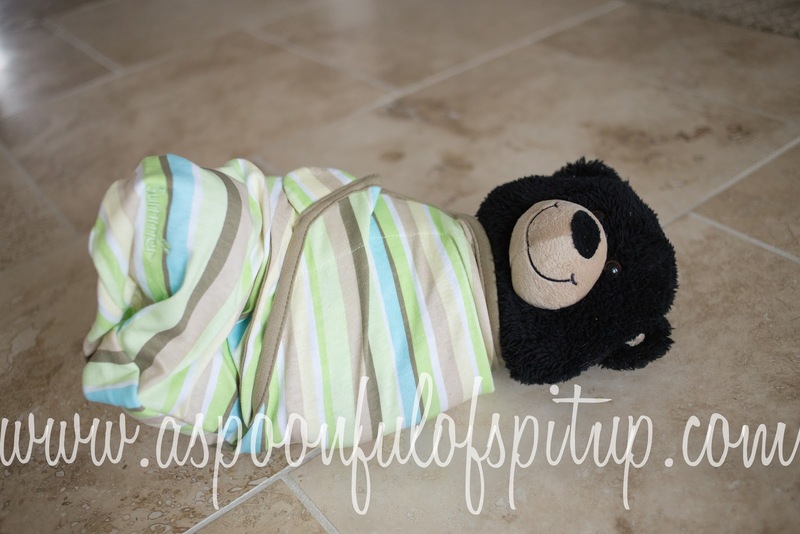 They have four different stages of swaddles, and one lucky winner will get all four! Yay! Stage one is the SwaddlePod. It can zip either up or down, which makes diaper changes easy...you can zip it up from the bottom so only the baby's legs are out. 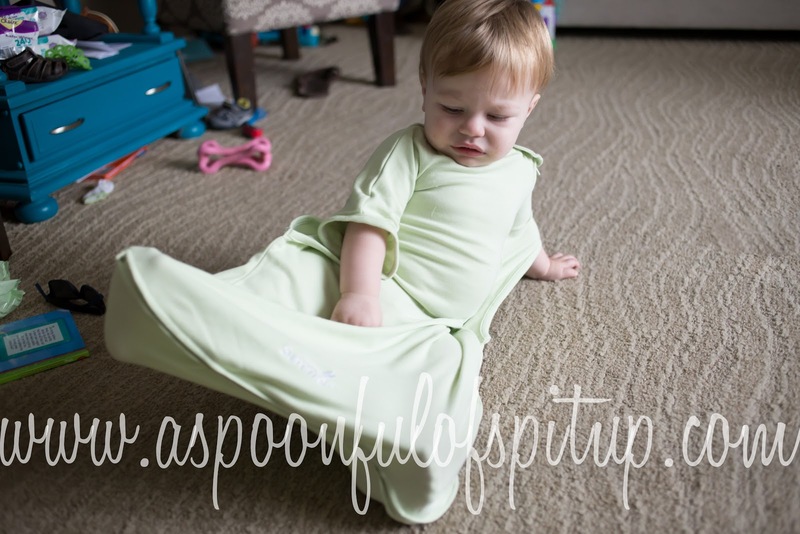 The SwaddlePod fits very snugly, and is perfect for little newborns! It fits babies between 5 and 10 pounds. 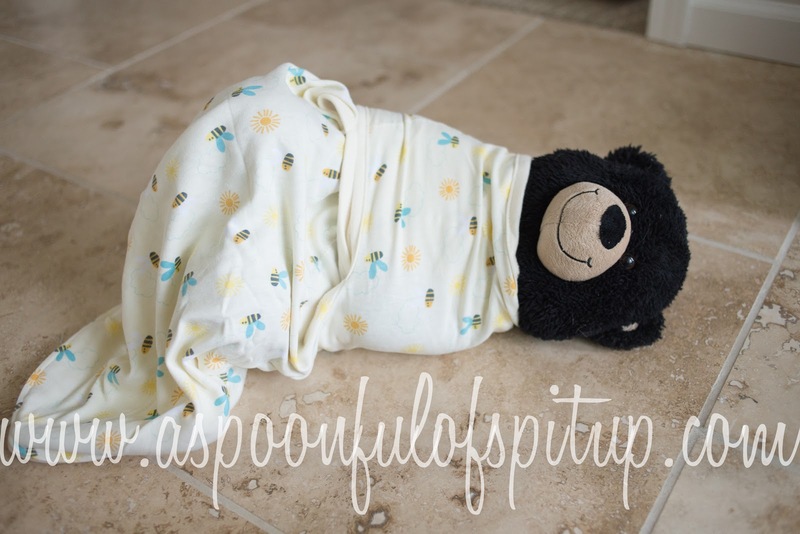 Bartholomew the Bear is standing in as my swaddle model. Isn't he a sweet little baby? Stage two is the SwaddleMe adjustable infant wrap. There are two sizes; small/medium fits babies between 7 and 14 pounds, and the large fits between 14 and 20 pounds. The baby's legs go in the bottom, and there are flaps that wrap around and velcro shut to hold their arms snugly. Stage three is the WrapSack, which is a transitioning swaddler and wearable blanket. 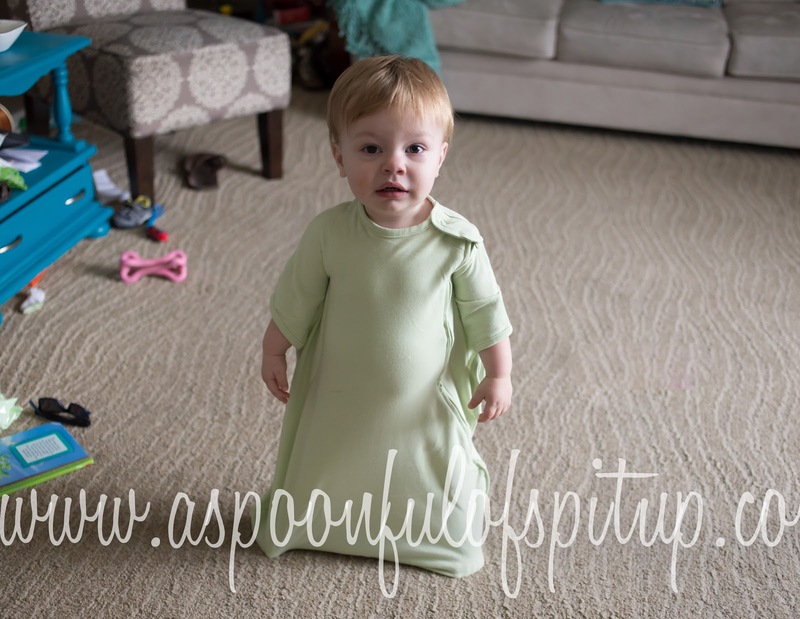 This swaddle can be used with the baby's arms either in the swaddle or out of it. 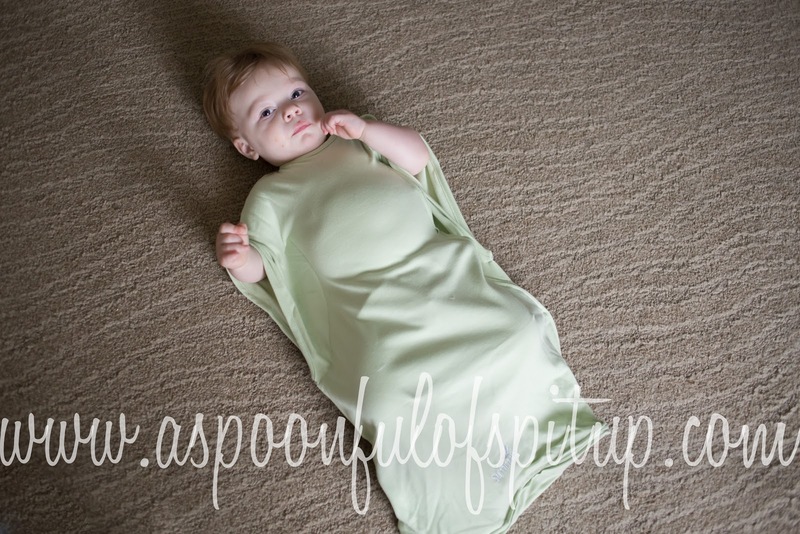 This is a great swaddle to use when your baby starts rolling over and needs to stop being swaddled. The arms are out, but you can still wrap it around the baby's body so they feel secure. Size small/medium fits 7-14 pounds, and the large fits 14-20 pound babies. Stage four is the ComfortMe wearable blanket. It zips down around the bottom for easy diaper changes (which is so nice! ), and the baby's arms are not swaddled. It gives the baby the feeling of having a blanket, but without the risks that come with blankets! The small/medium fits 10-18 pounds, and the large fits 18-24 pounds. Gibson was my model for this, and he was NOT a happy helper. He just wanted to walk around, which is hard when you're zipped into a wearable blanket! He is also nine pounds too heavy for the small size, which I have, but I managed to stuff him in! *If messy living rooms bother you, skip the next three pictures. You have been warned. Right before he decided to stand up and run away. Somehow he managed to stand up! Why can't I see my TOESSSSS??? I didn't have these swaddles when Gibson was little, unfortunately...but you can bet that I'll be using them when the next Spit Up baby comes along! They're well-made, washable, and help babies to sleep so much better! And anything that helps babies sleep is good in my book! And now you have the opportunity to win all four stages of Summer Infant swaddles! Even if you don't have a baby of your own, these swaddles would make a fantastic gift! Use the Rafflecopter widget below to enter. The giveaway is open to residents of the United States and Canada, and I will choose a winner on the morning of June 20th. Voting for my blog won't help you win this wonderful giveaway, but I would love it if you did it anyway! Just click the banner below! And remember to head over and enter the Tiny Elephant Bowtique giveaway, too! Disclaimer: I was not compensated by Summer Infant for this review. All opinions are my own! What's Your Baby's Poo Telling You? This is why we don't walk.